For two years I taught high school geography in southeast Nigeria. It was a remarkable experience not only because of the high scholastic demands of the students and the rich and complex West African culture, but also because of the natural environment of the tropical rainforest. Since I was a boy I had been reading the entertaining animal collecting stories of Gerald Durrell. Perhaps my favourite was the Bafut Beagles, which took place in the Cameroons. We lived in the same habitat about a day's drive from Bafut. As soon as I was established and had got my bearings of the local area, I sent word out to the nearby villages that I would pay money for small wildlife. Most of these went to the collection of the Carleton University Museum but some went to the Bronx Zoo Small Animal House. 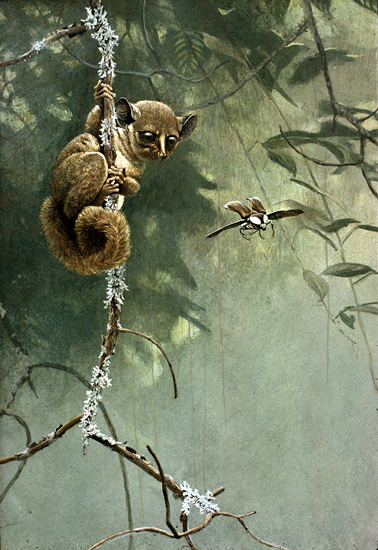 The most spectacular of these were the bush babies.